Been a while since I’ve made a post because I’ve been quite sick. The flu is a terrible thing! I’ve been wanting to make a post about Hearthstone’s new adventure expansion, Blackrock Mountain. Now that I’m no longer as concerned about dying I can write the post! Woohoo! The adventure is based off a famous WoW raid once again that I know almost nothing about. Looking at whats been released so far on the official website and trailer I can tell that the expansion has dragons, fire, and dwarves in it. I LOVE dragons, so this is gonna be a killer set for me. Moving on to a selection of the previewed cards though! 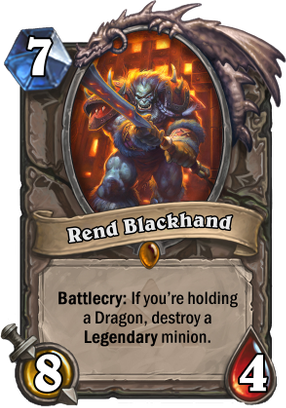 First up is the previewed Legendary, Rend Blackhand. Only useful in a very very specific situation. 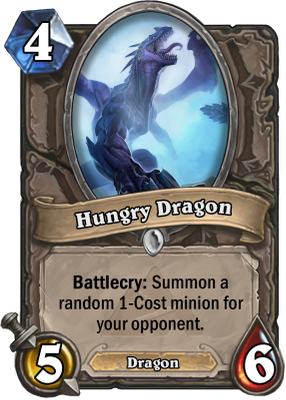 You have to have him and a dragon in your hand and your opponent has to have a Legendary on their board that is worth killing. Otherwise it’s basically a weak Core Hound and no one plays that because it’s bad. Next is the Hungry Dragon. I’m pleased by this new addition to the dragon forces in the game. It’s strong, but not overwhelmingly strong. Did I mention that it’s a DRAGON?!? 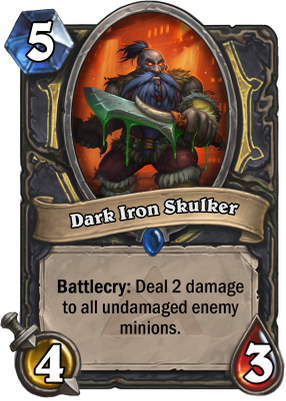 Then we have the Dark Iron Skulker. Pretty obviously intended as an anti-aggro card for Rogues. Rogues already have a few tools for this with Fan of Knives and their hero power. This card is even better because its basically a Consecration stapled to a 3 mana cost minion body for only 5 mana. You’re getting 2 mana of oomph for free if the Skulker damages all of your opponent’s minions. I think this one will see a lot of play. And the best for last! 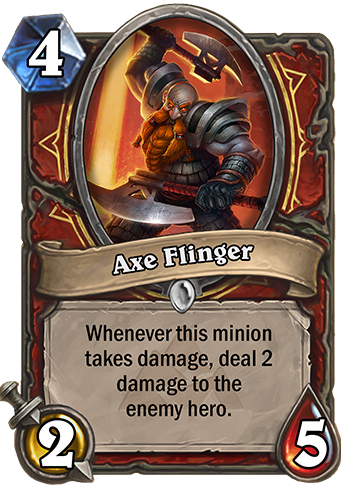 Axe Flinger! Super useful alongside Bouncing Blade, the GVG Warrior spell that deals 1 damage to a random minion and then another random minion until a minion dies. And the best thing about the Axe Flinger is that it immediately inspired me to make this video! Blackrock Mountain is scheduled to come out sometime in April. Hopefully we’ll get to see a few more cards before then! Woohoo! 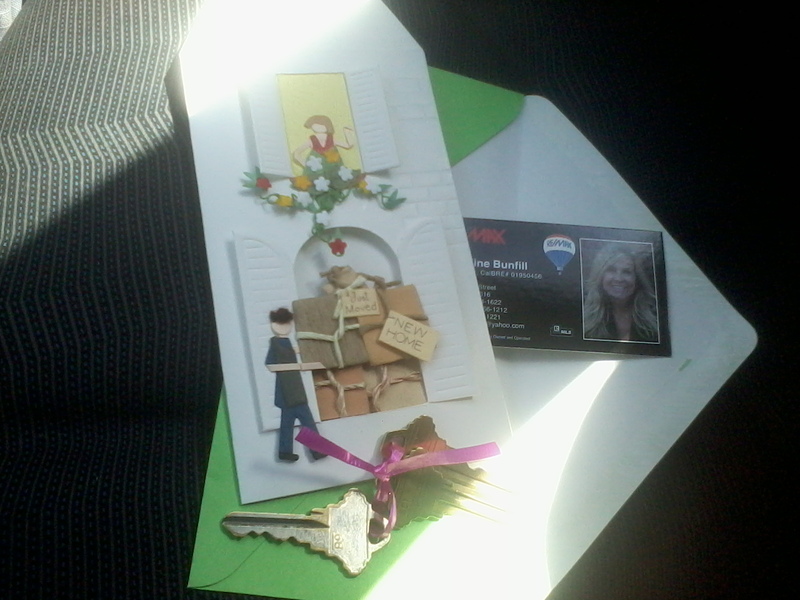 We got the keys to the house finally! I got them in the afternoon and we went to check out the house which is now officially ours later that day. We met one of our next door neighbors during that visit and her son and his children. Her son’s house had apparently burned down so they were staying there until they got a rental lined up. Pretty weird stuff, but that’s the way it goes sometimes. We learned a little bit more about the neighborhood too. The other next door neighbor house is apparently a boarding house for UC Davis students. We journeyed over to Ikea the next day to buy some furniture things. We got a new bed frame for our new bedroom. The old frame will be going in the guest room. We got some stuff for our second bathroom and we also got some curtains. There was an unfortunate problem with all the curtains at Ikea. Every single one of them was at least eight feet long. This is an industry standard I guess. We’ll have to cut and hem the curtains, but given how wide they are, we’ll need a sewing machine for that. Maybe we can borrow one from my family instead. Or just buy one. Hemming those curtains by hand would be a nightmare. And what would such a fun weekend be like without something going wrong! The hottest day of winter happened and we weren’t dressed appropriately (stupid Californians wearing sweaters in 65 degree weather!). We were unable to move as much stuff as we wanted to because of this. Next things on the agenda, assemble what furniture we did get from Ikea and start moving as much as can from our apartment to the new house before spring break when we get my wife’s parents to come up and help with the big items.